Apologies for not having posted a great deal lately. Rest assured we're making progress and taking pictures, but a combination of an insane work schedule and bandwidth issues has made adding things to the blog difficult. That's all about to change, so please bear with us. In the recent days we've finished the structure for our wheelhouse, taken the boat on it's first trip, and gotten the mast removed. Pix to come momentarily. In the middle of that, our POS hand pump in the galley decided to stop working. . .then to start working. . .then to stop working again. I guess this thing was cheap for a reason, hunh? So of course, I ordered a replacement, this time a Whale galley pump with far better reviews, and set about the knuckle banging task of getting the old one out. 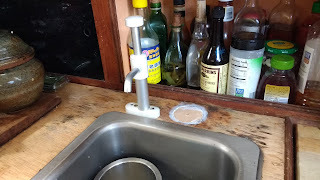 This was complicated by the fact that the old pump required a much larger hole (which had to be filled) and the fact that I'd installed the old pump before putting in the sink, meaning I had to reach under and behind the sink and to the new installation by braille. The new Whale galley pump. You can see the repaired opening to the right, which I now have to tidy up. But it's done. 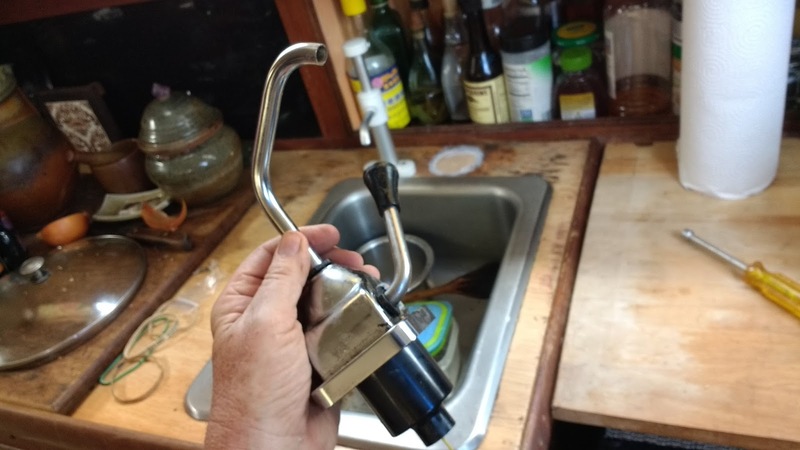 The Whale galley pump is smooth, and twice as fast as the old one (it works on both stroke directions). We're quite happy with it and I recommend it highly. So stay tuned. I'll be posting our first outing and the great mast removal saga shortly. We apologise for the inconvenience. . . .